UTCS-28 Wake up, I'm not done with you yet! Description: IFBB Pro Figure Competitor Hot Tamale visits Utopia fresh off earning her Pro Card and in near contest shape. She scissors Rich to within an inch of his life in UTCS-28, "Wake up, I'm not done with you yet!" This was not the intended title for this movie, however in editing we noticed Hot Tamale having to wake Rich up repeatedly from her non-stop leggy torture. We have to give Rich props for this one, as few people could really endure this kind off mashing. Hot Tamale is petite in stature, but there's something about the shape of her thighs that makes her scissors deadly. I know from experience, that just the act of having her thighs around your neck hurts. When she starts to squeeze him, it becomes really painful. When she bears down it feels like it could break! She makes him light-headed immediately, but she doesn't let go. She keeps him on the brink of survival the entire video. Excellent angles and superb close-ups highlight Rich's plight, and there's a nice segment where Hot Tamale straddles him in a Schoolgirl Pin and makes him worship her muscles as she flexes her ripped, peaked biceps. Totally dominant over him, Hot Tamale flexes in nearly every hold because she knows she's "The boss!" She never rushes, her reverse scissor sequence is 4.5 minutes by itself, the muscle worship and front scissor sequences are another 5. 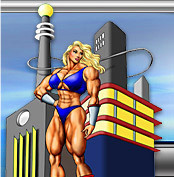 We guarantee you'll feel Rich's pain and have new respect for him when she finally stands over him flexing her amazing physique in a fantastic Victory Pose. Check out UTCS-28, "Wake up, I'm not done with you yet!" today. Hot Tamale is as her name indicates, one of the hottest women in mixed wrestling! 16 minutes long and only $15.95. PLEASE NOTE: This clip is available here in the Clips Store as a standalone, or in the Members' Area. Enjoy!